A qualified building workforce is essential to ensure the higher levels of quality required for moving towards Nearly Zero-Energy Buildings and to accelerate the rate of building renovation in Europe. It is particularly important to train construction workers, as well as middle and senior level professionals throughout the entire building value chain, in order to address the upcoming challenges. These include new materials and technologies, the integration of renewables, and collaboration using Building Information Modelling. 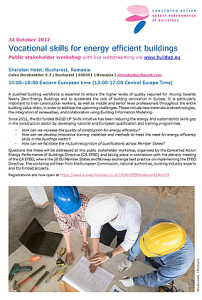 Questions like these will be addressed at this public stakeholder workshop, organised by the Concerted Action Energy Performance of Buildings Directive (CA EPBD) and taking place in connection with the plenary meeting of the CA EPBD. The workshop will hear from the European Commission, national authorities, building industry experts and EU-funded projects. The event will also be streamed live via www.buildup.eu. You can also send your questions to the panel at irati.artola@trinomics.eu. More information and a detailed agenda of the event are available in the flyer. You can also download a file with short CV’s of the panellist speakers here.